Man lives in the sunlit world of what he believes to be reality. But there is, unseen by most, an underworld. A place just as real, but not as brightly lit. A darkside. Okay, so the opening narration loses a good chunk of its scare-power without the creepy voice and spooky forest, but you get the picture. Tales from the Darkside, the TV series, was one of my all-time favorite anthology horror shows, right up there with the likes of Tales from the Crypt, Monsters and the Twilight Zone. It’s hard to count the number of fantastic episodes it featured, and much to my joy, the Movie is actually just as good as the best episodes of the television series. 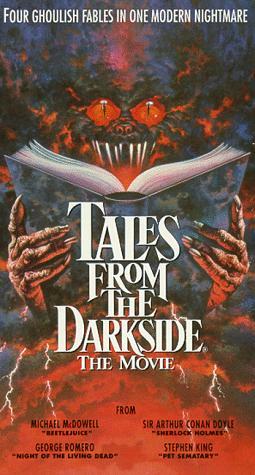 Tales from the Darkside: the Movie featured three separate scary stories told to the audience via a wrap-around scenario. The wrap-around story is nicely original, forgoing the standard “Cryptkeeper” approach (Creepshow, Tales from the Crypt) and instead telling the stories via a modern day “Hansel & Gretel” tale. It seems a young boy named Timmy (Matthew Lawrence) has been abducted by a modern day witch who has him chained-up inside a jail cell, intent on cooking him for supper. To stall for time, Timmy reads stories from a book titled “Tales from the Darkside”. The dark humor in this story is where Michal McDowell’s (Beetlejuice) presence is really felt. It’s a quirky change of pace from the usual gruesome story-tellers of anthology horror films. The first tale, “Lot 249”, has been adapted by Michael McDowell from a story originally written by Sir Arthur Conan Doyle. That’s right, the Sherlock Holmes-guy. “Lot 249” tells the tale of a college student (Steve Buscemi) whose roommate’s (Christian Slater) friends cheat him out of a scholarship to an exclusive European school. Buscemi happens to be a collector of antiques, and by happenstance, acquires the corpse of a centuries-old mummy labeled “Lot 249”. While examining the mummy, Buscemi discovers a scroll which contains an incantation to bring the mummy to life. Buscemi then uses the mummy to carry-out a horrible revenge on his roommate’s pals. Perhaps not the most original story of the bunch, but good if you’re a fan of mummies. The kills in the story, however, are absolutely brutal. A guy getting his brains yanked out through his nose and dumped in a fruit bowl, or a chick getting her back slit open and having carnations stuffed inside her flesh. Ouch! Some good star-power, too. Steve Buscemi is just such a creepy-looking guy. The second story, “the Cat from Hell”, is a story written by Stephen King and adapted by George A. Romero. An elderly man (William Hickey; “the Nightmare before Christmas”, “Puppet Master”) hires a hitman to assassinate a mysterious black cat lurking around his mansion. He claims the cat has killed everyone else in his household and is now planning on killing him. The hitman stays true to his word and attempts to kill the cat, but finds the cat isn’t easy prey. One of the best stories, though they get progressively better as the movie goes along. It’s notable for, well, the way the cat does the hitman in. I really don’t want to ruin it for anyone, but I really want to mention it, too. A conflict of interests, here. Anyhow, it’s spectacularly gruesome. The final tale, usually considered the best, is “Lover’s Vow”. A down-on-his-luck artist is washing away his sorrows at a bar one night when he’s attacked by a hideus gargoyle which slaughters the bartender. The artist begs for his life, and the gargoyle agrees to grant him his wish, so long as he never tells anyone what happened or what he saw. The artist agrees and runs away. On his way home he runs across a beautiful woman. Fearing for her safety, he takes her back home to protect her from the gargoyle. They fall in love and eventually marry. However, some things are too good to be true. Some of the best special effects and one of the better stories, too. The gargoyle is extremely nasty-looking. You can, of course, guess how the tale ends, and it’s wonderfully tragic in a way. These stories really do feel like they jumped right out of an old EC horror comic. A real treat to have this movie on DVD. I can only wish that the TV series might get some season sets in the future. A definite must-see for fans of anthology horror.